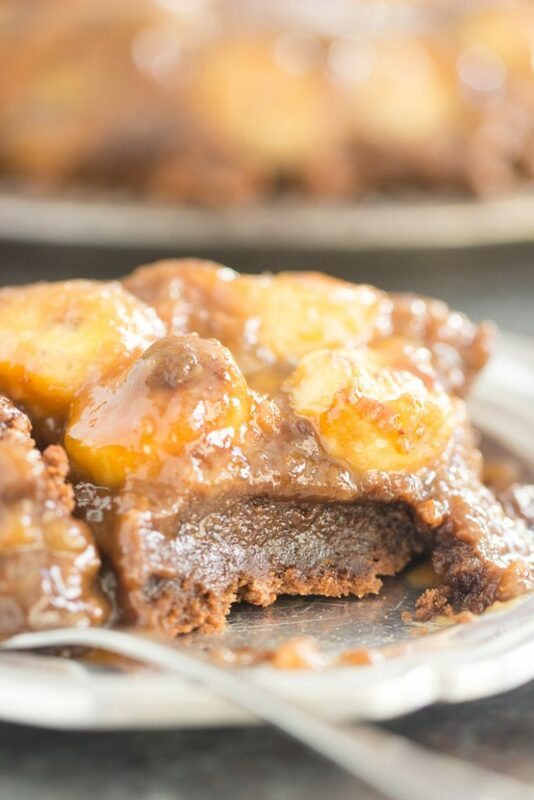 This Chocolate Peanut Butter Banana Upside Down Cake is insanely delicious. 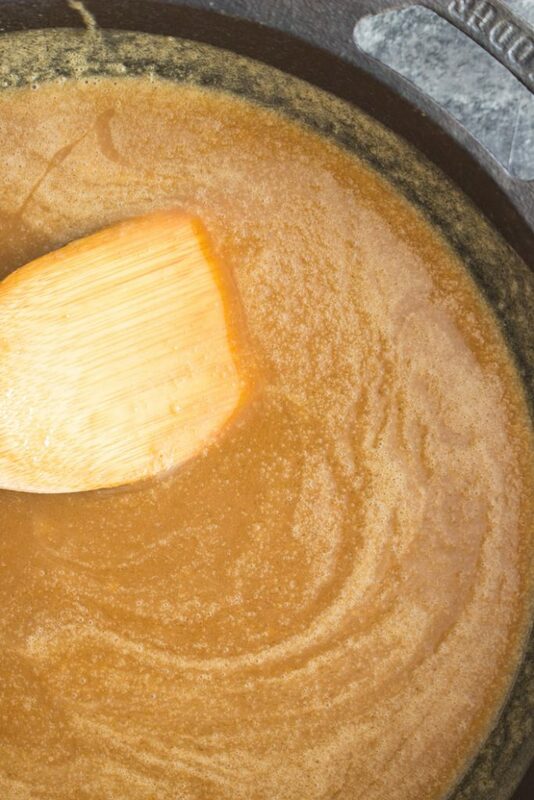 The combo of flavors and textures is unmatched, and you’ll lose your mind over the ooey-gooey peanut butter caramel topping! 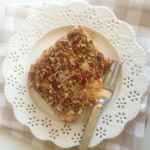 This Chocolate Peanut Butter Banana Upside Down Cake is not the most beautiful dessert, but it’s positively divine! I think we can all agree that there are different types of desserts in this world, and they are suitable for different types of occasions. Some desserts are more fancy and formal, while others are quite unpretentious and uncomplicated. 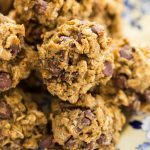 Some are seasonal – like for holidays, and other desserts, perhaps no-bake desserts and ice cream recipes, are most fitting for spring and summer. Right?? We all agree. Eat anything, anytime you want, but most things have an optimal time and place. 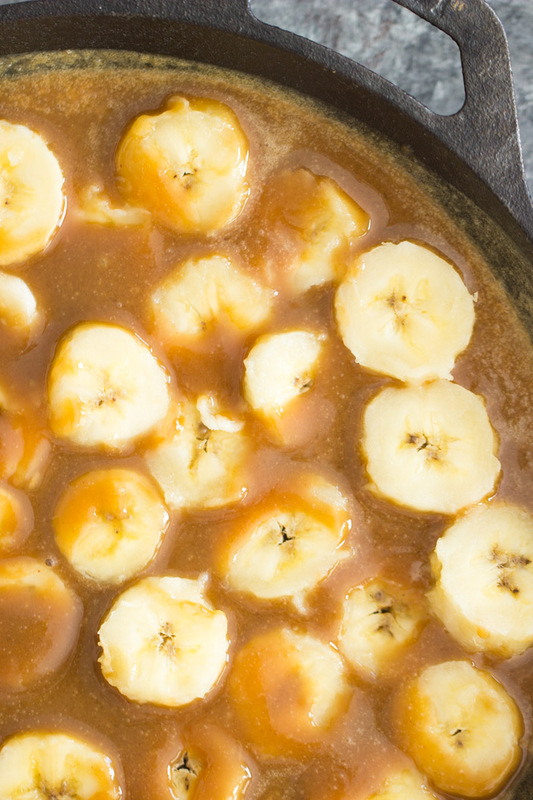 This Chocolate Peanut Butter Banana Upside Down Cake is like the sweatpants of desserts. 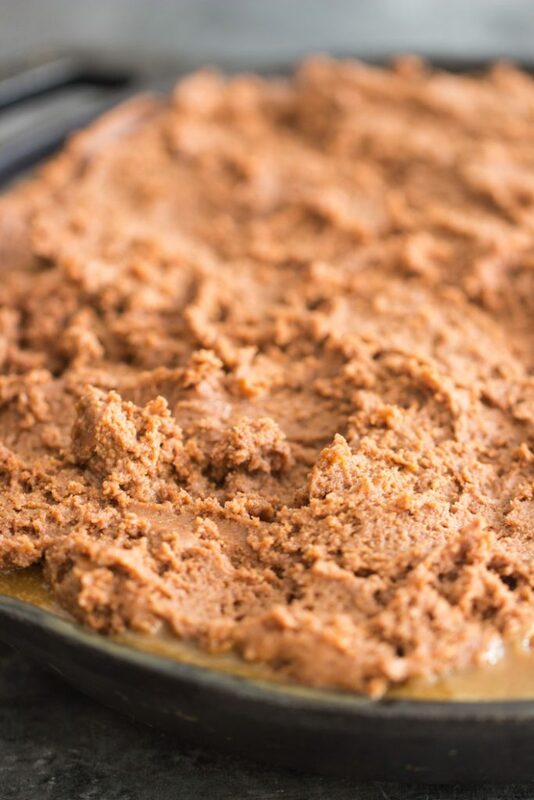 It’s the least fancy, least presentable, most messy dessert of all time. This is the kind of dessert that you serve to a small group of close friends when they’re over to share a few bottles of wine. You can all just dive in with a fork! Or what you and your significant other share on a nice and cozy movie night. It’s one of the most fabulous desserts you’ll ever try, but it’s like sweatpants. You don’t want to take this Chocolate Peanut Butter Banana Upside Down Cake to your in-laws for Christmas dinner, just like you probably wouldn’t wear sweatpants to a holiday either. Oh wait, I do that all the time. This Chocolate Peanut Butter Banana Upside Down Cake is kinda ugly food! As long as something tastes good, I’m a happy camper, and I don’t care too much whether it’s beautiful and impressive to look at. I care that it’s mouthwatering and decadent and delicious. 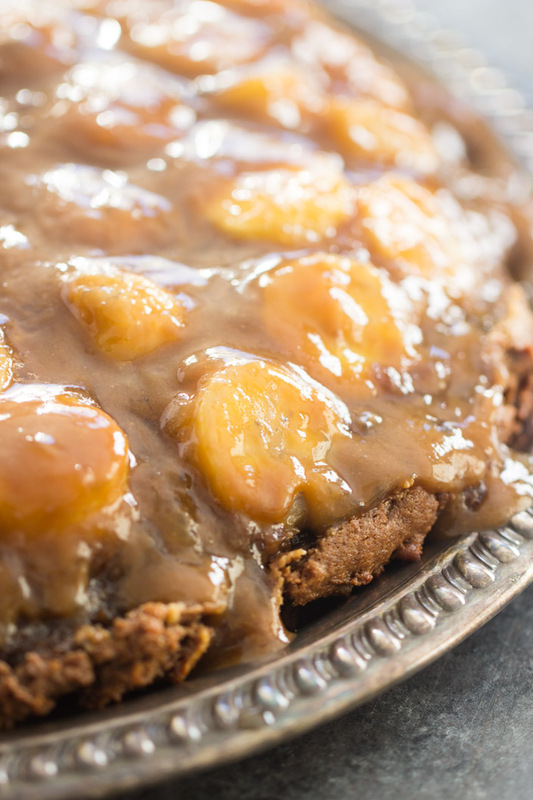 As far as that goes, this Chocolate Peanut Butter Banana Upside Down Cake doesn’t disappoint! The layer of peanut butter caramel on top is beyond generous. There’s tons and tons of that gooey, sticky caramel, and it drips and seeps down everywhere. The bananas caramelize while they bake, so they’re ultra soft and sweet. 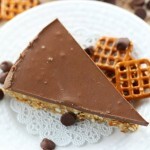 And the chocolate peanut butter cake… it’s crispy on the edges, but moist and dense on the inside, almost like brownies. The cake layer is so rich and moist, and all the flavors together are just insane. I’m sure I don’t need to sell you on the combo of chocolate, peanut butter, and bananas! I have a bunch of recipes with that amazing trifecta, and some of the most popular are these Chocolate Crepes with Peanut Butter Marshmallow Filling & Caramelized Bananas. They’re a little extra work, but worth it. A total dessert crepe! 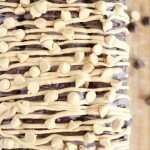 And these Peanut Butter Banana Brownies and this Chocolate Peanut Butter Cup Banana Bread feature the same awesome flavors. The ingredient list for this Chocolate Peanut Butter Banana Upside Down Cake looks long, but they’re all common and easy to find. The directions are quite simple and straight-forward too. 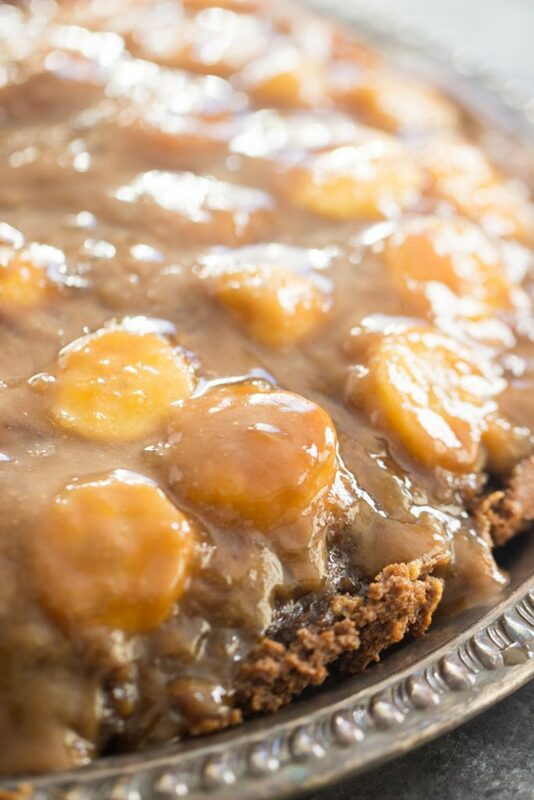 While this Chocolate Peanut Butter Banana Upside Down Cake recipe is not the prettiest to look at, it is one of the most incredible desserts to taste! I don’t pay much attention to how the cake looks, if I know how it tastes. 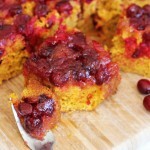 This cake has a super moisture texture and I am sure I will love it. I love the pie on the pictures and I love baking. Today I’m going to bake this pie. Thank you for the recipe.